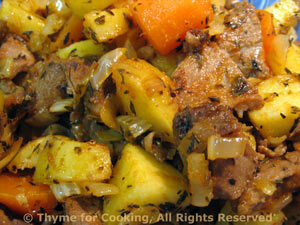 Chunky Beef Hash, quick, easy, healthy from Thyme for Cooking. Steaming the carrots and potatoes lets them brown quickly without long cooking. The ketchup and Worcestershire makes it savory; if you like it hot, stir a drop or two of hot sauce into the ketchup before adding it to the skillet. Cut potatoes and carrots into large bite-size pieces. Steam for 15 minutes over medium-high heat, until vegetables are just tender. Chop onion and celery and mince garlic. Cut beef into bite-size pieces. (If it's a flank steak, cut the pieces diagonally across the grain). Heat 1 tbs oil in large nonstick skillet over medium - high heat. Add onion and celery and sauté until tender, about 7 minutes. Add garlic and sauté 2 minutes longer. Remove onion, etc to a plate. Add beef to skillet and sauté 3 - 5 minutes until browned. Put on same plate as onions. Heat remaining 1 tbs oil in skillet and add carrots and potatoes. Stir-fry until vegetables are lightly browned. Return onions, celery, garlic and beef to pan and heat through. Add Worcestershire sauce, thyme, stock, ketchup and heat through, stirring constantly, 2 - 3 minutes over medium heat. Serve.